14 February 2017, at 6:00a.m. Backyard flocks are generally healthy, like the people who keep them. Just like their keepers, though, illness can strike. You can minimise the damage by protecting your flock from disease and limiting it if and when one of your chickens shows up sick, writes Christine Heinrichs. Chicken diseases are an example of the old adage, an ounce of prevention is worth a pound of cure. Some basic practices can reduce your flock’s exposure to disease. If one does get sick, taking action can keep the rest of the flock from catching it. Chickens catch communicable diseases the same way people do: directly from other sick chickens, or indirectly from something that is contaminated by sick chickens. Backyard chickens typically catch a minor illness and acquire immunity as they recover from it, as people do. Think Biological Barrier. Break the link between a possible source of infection and your birds. The first step is to limit their contacts with other birds. Set up disease prevention practices when you build the coop. Have a section that can be used to quarantine birds. Your chickens aren’t going to school or the market, but you could bring infection into your flock when you bring home some new birds. Make sure any birds you introduce to your flock come from a flock that isn’t sick. However, they may harbour germs which haven’t sickened them yet. Put the newbies into a separate section, away from the rest of the flock for a week or ten days. That will give them time to reveal whether they are carrying something, without infecting the rest of the flock. Take time to make sure they don’t have any external parasites. Lice and mites spread quickly through a flock and can be difficult to eradicate. The whole coop needs to be disinfected once they take hold. Quarantine any chicken who shows up sick. Signs of illness can be subtle. As prey birds, chickens will conceal their weaknesses. Look for unusual postures, inactivity, ruffled feathers, droopy wings, a pale comb, diarrhoea, laboured breathing, or any change in behaviour. Your experience with the individuals in your backyard is an advantage here. Take note of the usually active hen who is slow to come out of the coop. Taking birds to shows is fun, but they can be exposed to disease. Quarantine them for a week or so after they bring their ribbons home. Stay in touch with other exhibitors. If some disease is making the rounds, you’ll hear about it. By the same token, inform the show secretary if your birds get sick after the show. 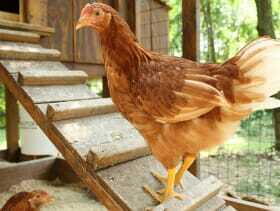 Friends who keep chickens may carry germs on their clothes or shoes. If you have visitors who want to enter the coop, ask them to use disposable booties to cover their shoes. They’re inexpensive and available online. Use clothes that can be washed or a coat that is designated for use around the chickens. Wash the clothes frequently. Have boots that are used only in the backyard. Don’t track infection in on your feet. A healthy flock is less likely to get sick, and recover better if something does affect them. Environmental stress can make the flock susceptible. Give them plenty of space, a nutritional feed, plenty of fresh water and a well-ventilated and secure coop. Protect them from extreme weather, out of the rain and mud. In very cold weather, give them some warmth. In hot weather, give them shade and cool water. Keep the feed area clean. Chickens like to scratch on the ground, but excess feed attracts rats and mice. Rodents can carry diseases that can infect humans, although usually only through eating the meat. They’re nasty and eat up food the chickens should have. A rat-proof feeder can help. My girls don’t tolerate rats and I occasionally find a dead one in the coop. Some chickens will catch and eat mice. A few diseases that affect chickens also affect people. Despite intense news coverage of highly pathogenic avian influenza (HPAI), few cases have infected people, and then only under unusual circumstances of intense crowding and close association. The overwhelming majority of poultry deaths due to HPAI are from intentional depopulation to avoid the possibility of infection rather than actual cases. Don’t let fear of HPAI keep you from having a backyard flock. Salmonella is one germ that may not make chickens sick, but can infect people. Don’t spread disease to yourself. It can cause nasty diarrhoea. Wash your hands, and no kissing your chickens. Keeping a chicken diary can be invaluable in the event your chickens fall ill. It doesn’t have to be extensive. Even a few notes on the calendar can help trace who visited last week or when the weather changed. Make a note of any unusual events in the flock: a droopy chicken, or a predator attack. You think you’ll remember, but life is complicated. Write it down. A written record is invaluable if she gets sicker or other chickens in the flock fall ill. If one or more of your chickens gets sick, you can watch and wait, or treat her. Most of the afflictions affecting backyard chickens are self-limiting, that is, the chicken will recover on her own. Keep her away from the others and give her supportive care: good food, fresh water and rest. Sick chickens may not have much appetite. Feed her what she likes. If cooked rice or oatmeal suits her, indulge her. She’s a pet. Keep her litter clean. If she’s really suffering, euthanasia may be the best choice. Over-the-counter medications are available at feed stores. This is tricky. Treating a wound with antibiotic cream is reasonable, but diagnosing a chicken with ruffled feathers and diarrhoea covers a lot of possibilities. Consider consulting a professional. Most veterinarians aren’t familiar with chicken care. Even farm vets usually focus on large livestock mammals such as horses and pigs. Call around to get a recommendation from your chicken friends. Check with local vets. Books directed at veterinarians such as Backyard Poultry Medicine and Surgery: A Guide for Veterinary Practitioners are available. I recommended it to my local vets and am willing to purchase it for them. Making a contact in advance, when your flock is healthy, can alert the vet to potential future need. Be willing to bring in a healthy chicken to help them get acquainted. If you decide to treat with drugs, remember that they will be present in her eggs for some specified period of time. Don’t eat them until you are certain that the drug has been eliminated. The drug information sheet will have this information. If it applies only to meat chickens, add ten days for eggs. Drugs can be deposited in the egg up to ten days before the egg is laid. Backyard chickens don’t often get sick, but it can happen to anyone. Planning ahead can protect your flock. If illness strikes, stay calm and your flock will likely emerge strong on the other side. This article was originally published in the May 2016 edition of The Poultry Site Digital. For more, read other articles from the issue by clicking here.